Last week was the publication of the findings of Harvard Business School’s 2013–14 Survey on U.S. Competitiveness, on which I already discussed on a previous post. Going further on the challenging transition of the current economic structures I would like to make some points around the 3D printing, maker movement and new ways of doing business in a networked/P2P economy (1). The first update comes from Jeremy Rifkins conception of the 3rd industrial revolution or Zero Margin Cost Society. Rifkin assume that industrial revolution are based on structural modification over 3 domain: communication, energy and transportation (that include logistics). If last revolution was structured in a way where everything was centralized then distributed in a producer/customer relation, meaning a high transaction cost, now in a network economy based on p2p prosumers relation, the margin cost can get to nearly zero. That’s saying a democratization of everything. 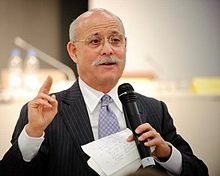 (1) For the essentials of arguments see "Jeremy Rifkin on the fall of capitalism and the internet of things (april 2014) that mostly echoes the previous Porter & Rivkin (2014) report on USA competitiveness decline. (2) Taking the discovery of mirror cells Rifkins assume against the Rational choice theory that human being instead of having instinctive selfishness behavior are fundamentally emphatic.